Every once in awhile I’m going to deviate from the topic of Lagoon to explore other parks and resorts in the area. I had never heard of Majestic Park in Salt Lake City until a few months ago while searching for details on an early coaster which Richard Munch’s 1991 Roller Coaster Directory claims existed at Lagoon under the name “Race Through The Clouds”. I was also unaware that a scenic railway once operated on the grounds of the Salt Palace so there is sure to be much more interesting history yet to be rediscovered about the area. Standing at the 900 South entrance to Ken Garff Honda in Salt Lake City, it may be hard to imagine a 300-foot replica of the Eiffel Tower standing as the entrance to what was once envisioned to be the city’s amusement center. But that’s exactly what the Majestic Park Company had in mind. Proposed additions to Majestic Park in a 1915 newspaper ad. Majestic Park opened around 1913 on the grounds of the original Salt Palace which burned down in August 1910. It featured a 23,000-square-foot dance hall and baseball diamond which was home to the original Salt Lake Bees franchise starting in 1915. There was also a bicycle track which could have been a remnant from the days of the Salt Palace. 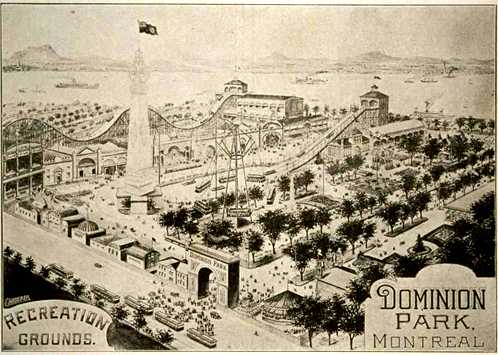 The park was to be designed by James Carey of New York who also designed the original Luna Park at Coney Island and Dominion Park in Montreal. 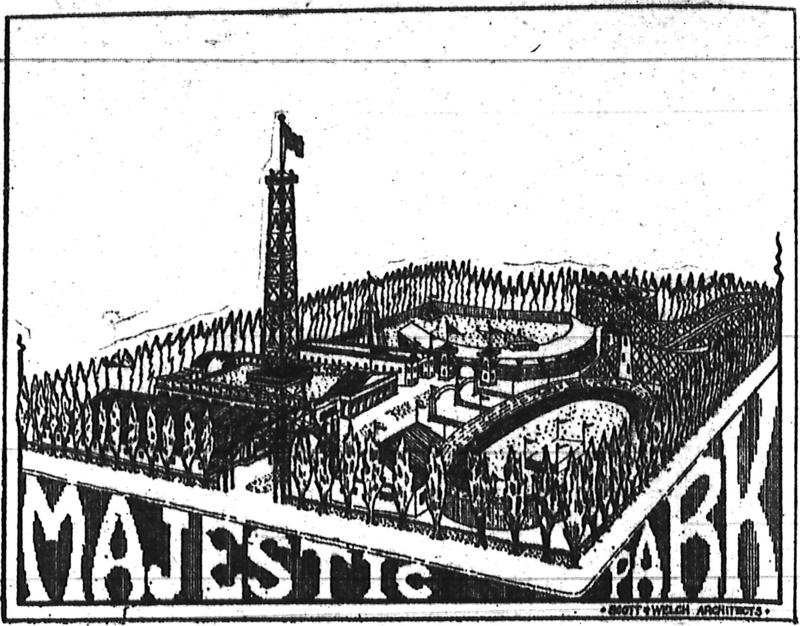 Both parks featured a single, large tower as a focal point much like the Eiffel Tower replica that would have been at Majestic Park. As far as I can tell, the Eiffel Tower, swimming pool, roof garden and racing coaster were never built and Majestic Park never seemed to fully evolve into the amusement park it was meant to be. A larger dance pavilion was built in 1916 and the name changed to Bonneville Park the following November. 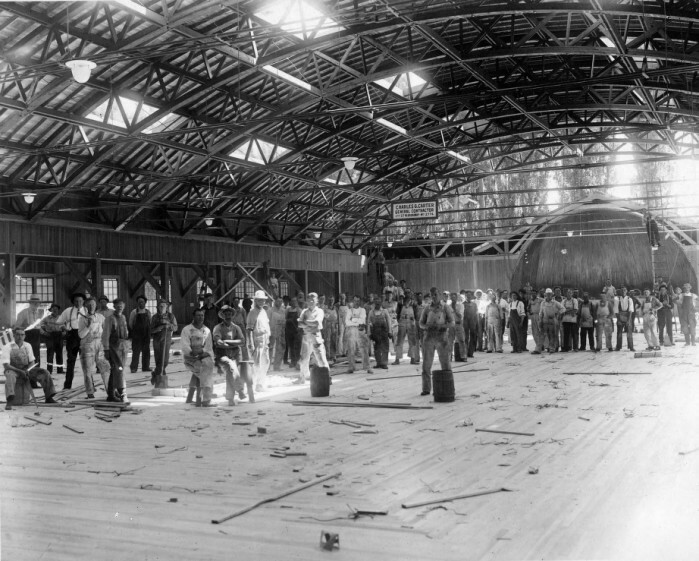 New dance hall under construction, 23 Jul 1916. Used by permission, Utah State Historical Society, all rights reserved. The Salt Lake Bees continued to play there until the franchise moved to Hollywood after the 1925 season¹. Meanwhile a new Salt Lake Bees team was created for the Utah-Idaho League and later the Pioneer League. Another season was played at Bonneville Park after the war, but the stadium suffered a fire just days after the playoffs ended. Salt Lake Tribune sports editor, John C. Derks headed an effort to rebuild a new stadium on a vacant lot a few blocks south which would be named Derks Field in his honor. This was replaced with the new Franklin Quest Field (now SpringMobile Ballpark) in 1994. In the ’60s, the southern half of the former Bonneville Park was occupied by a Ramada Inn, which later became a Holiday Inn and is now a transitional center for the homeless called Palmer Court. 1. The original Salt Lake Bees franchise started out in Sacramento in 1903 and then moved to Tacoma, back to Sacramento and to San Francisco before settling in Salt Lake City. As part of the Pacific Coast League, the other teams were a good distance away from Salt Lake City. High travel expenses led to the decision to move the team to Hollywood where it later became the Hollywood Stars. The Hollywood Stars moved again in 1936 when they became the original San Diego Padres. The franchise came to an end in 1968 after the owner at the time, C. Arnholdt Smith, won a bid for a National League expansion team. He used the same name of his old team when he created the San Diego Padres we know today. Pavilion At Majestic Park. Deseret News, 26 May 1913. Majestic Park Company advertisement. Deseret News, 26 Feb 1915. Majestic Park Company advertisement. Deseret News, 1 Mar 1915. Permanent Home Is Planned For Bees. Deseret News, 16 Sep 1915. F.S. Murphy Says Baseball Club Had No Interest In License. Deseret News, 11 Mar 1916. Majestic Park To Be Amusement Center. Deseret News, 24 Apr 1916. Majestic Park Opens. Deseret News, 31 May 1916. Park Name Changed. Deseret News, 4 Nov 1916. Games of Chance at Bonneville Park Closed. Deseret News, 6 Oct 1917. Idaho Falls And Pocatello Ready To Enter New Ball Circuit. Deseret News, 9 Feb 1926. Writers Plan Plaque; Spur Derks Dedication. Deseret News, 25 Jul 1948. Schindler, Hal. Utah Grows Up With the New Century. The Salt Lake Tribune, 28 Jan 1996. Zingg, Paul J. & Mark D. Medeiros. Runs, Hits and an Era: The Pacific Coast League, 1903-58. University of Illinois Press, 1994. Dominion Park. Closed Canadian Parks, accessed 18 Mar 2011. History – Salt Lake Bees Spring Mobile Ballpark. SaltLakeBees.com, accessed 29 Jun 2011. RE: Lagoon’s Herschell Kiddie Coaster. Email message sent to author from Duane M., 6 Mar 2004.